Lose Weight Without Exercising? What?! Did you make a resolution back in January to lose weight? Have you met your goal? If you are like many dieters, after a few months of going to the gym and eating crazy concoctions to drop the pounds, you probably find your weight loss at a standstill. Or maybe, you’re an Ideal Protein success story and you want to maintain your new body for summer. So, what’s the most efficient way to lose weight and stay in shape? Is it even possible to lose weight without exercising? When you envision staying in shape, most think of some form of exercise. In fact, exercise can help you maintain a healthy weight and it’s fundamental for your cardiovascular and musculo-skeletal systems. 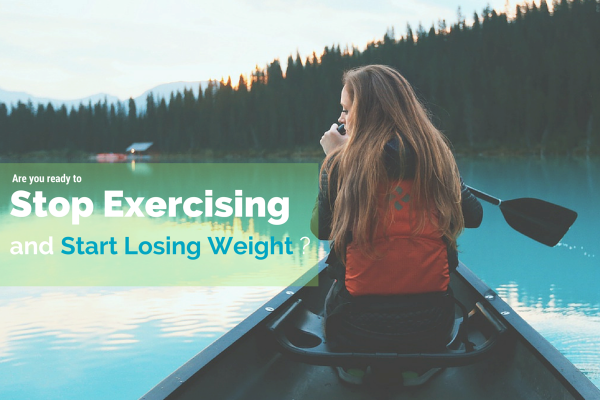 However, did you know exercise is NOT the best way to initially lose weight? We’ve been conditioned to believe that we must exercise to burn calories. The truth is, it’s more efficient to simply change the way you eat, without the strenuous exercise, if losing weight is your primary goal. Studies show exercise can temporarily suppress your appetite, but over time, your body creates hormones that increase hunger to replace the calories burned durning exercise. Bottom line, high impact exercise will make you hungry. So, where to go from here? Eat right. Discover how the body burns fat and use techniques to encourage fat burning while maintaining muscle. Your transformation starts with understanding how you gain weight. Learn how to make healthy choices and avoid foods that sabotage your goals. Move it. Instead of an intense gym workout, get active by setting a goal of 10,000 steps a day. Keep your end result in mind, not necessarily the calorie burn, but more about the healthy active lifestyle. Once you meet your goal, maintain your ideal weight by staying active. Exercise has benefits, but don’t rely on it for weight control. Sleep tight. Get a good nights sleep – 8 hours a night is recommended. Sleeping less than 8 hours a night limits your body’s ability to burn fat, according to research conducted at the University of Chicago. The study also revealed, people consume about 300 more calories a day when not well rested. Sleep is a secret weapon to your diet’s success. Have you been wasting your time sweating in a gym to lose weight? There is an alternative! Join us Wednesday night for an informative weight loss workshop and bring your gym pals along too to find out how to lose weight without exercising!